A special post-birthday shout-out to my boyfriend Andy who turned 33 this week! While last year we celebrating by exploring the fabulous town of Skaneateles, this year we celebrated by going out to eat at SUMO hibachi and later enjoying his favorite cake – a marble filled with apricot preserves and topped with a rich mocha frosting. Bake the cake according to the instructions on the box, using two 9-inch rounds. Spread the apricot preserves over the first round. Be generous, as the cake will absorb the preserves over time. To prepare frosting, whip butter and instant coffee granules together until fluffy.with an electric mixer. Turn mixer to medium/high speed and slowly pour in whipping cream and whip until the mixture is light and fluffy. Mix in vanilla extract and melted chocolate while whipping on medium/high speed. Gently place the second round of your cake atop the first. 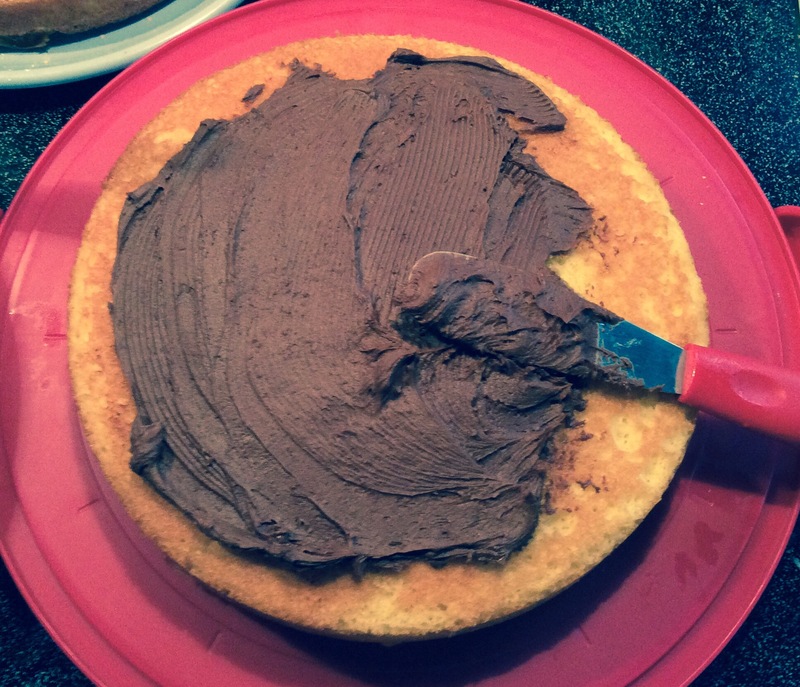 Generously apply frosting to the top and sides of your cake. If desired, decorate with chocolate chips and cocoa powder. Original frosting recipe retrieved from http://www.bakeaholicmama.com/2014/01/chocolate-cake-with-whipped-mocha.html. The recipe has been altered from its original format. Last night as I was preparing for the impending snowstorm, I decided to try making a rich and cozy dessert: bread pudding. Although I had never actually made bread pudding before, I found through some internet skimming that most recipes were extraordinarily simple. I decided to give it a go and found that with such a short time required for preparing the dish, bread pudding actually makes for a great week-night dessert, or in this case, addition to a blizzard preparedness plan. I followed the recipe closely, though I used chocolate chips or morsels instead of grating a bar of chocolate and also had to bake my pudding ten minutes longer than the recipe suggested. The dessert really did come out great, and the blend of cinnamon, almond, chocolate and Kahlua made for a great cozy-feeling dessert on a cold winter night. I acquired said recipe from FoodNetwork.com and would certainly recommend it to anyone looking to try out a rich and flavorful dessert. Click here to check it out! Although I do not look Italian, it is the culture that is my most direct lineage. That being said, I grew up eating a lot of Italian food. Aside from it being my favorite food to eat, it is also my favorite food to cook. Today, I’m sharing with you a deeply satisfying recipe for stuffed shells, a dish that’s both easy to make and delicious to eat. Boil your shells until they are al dente (this means that they are firm, and still have a bit of a crunch to them). Combine the ricotta cheese, eggs, a ½ cup of mozzarella, parsley, salt, pepper and garlic powder together in a large bowl. Spread a thin layer of sauce over the bottom of your 9×13’’ pan. Drain the shells and begin stuffing them with your cheese mixture. Be generous in the amount of cheese you are stuffing your shells with. Next, cover your shells will the remaining sauce. (For an interesting twist, mix in fresh sliced mushrooms with the sauce before pouring the sauce over the shells). Cover with the remaining mozzarella. Bake for 45 minutes to an hour in the oven at 350 degrees Fahrenheit until the shells are heated through and the cheese is bubbly. Sprinkle with grated Parmesan cheese and enjoy! Growing up, my mother would always get annoyed with my father’s birthday cake request: cake made from packaged mix (such as Betty Crocker, Duncan Hines, etc.). Although she always wanted to make a homemade cake, he insisted that he liked pre-packaged mix the best. Although I was once opposed to boxed cake mix myself, I have come to realize that it doesn’t really matter if your cake is homemade or not. What matters is the frosting. And you most definitely want homemade frosting. Sift sugar and cocoa together. In a separate bowl, combine 1 cup of sugar mixture with butter and 1 tablespoon of cream. Beat until smooth. Keep adding the sugar mixture cup by cup, with each accompanied by another tablespoon of cream. Continue until all ingredients are combined and frosting is fluffy. If the requirement for heavy cream isn’t enough indication that this recipe is delicious, take my word for it! And if you find yourself in a situation that calls for packaged cakes, don’t fret. Simply enhance it with homemade frosting.